Many wholesalers think they need a massive list of prospective buyers to sell their properties to. Cris Chico tells us why that’s a myth, and gives us advice on the right way to build your buyers list. Don’t miss this FlipNerd.com Flip Tip! Mike Hambright: Hey it’s Mike Hambright from flipnerd.com and we have a quick V.I.P. 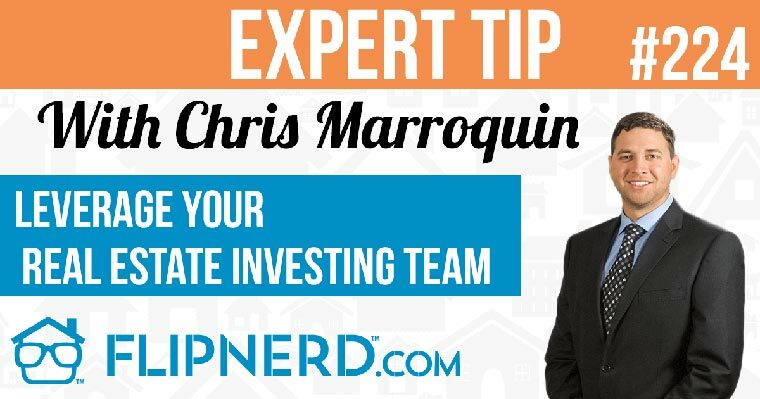 tip to share with you from Chris Chico, who’s going to share a tip on what the single biggest flaw when building your buyers list is. Chris Chico: One of the things that I see all the time is, is people trying to build a huge buyers list. They want to build a list of a thousand or two thousand people so that can, as soon as they have a property, they blast it out and send it to off. And, especially for somebody starting out brand new, it’s not really a feasible option, number one, and two, I think there’s a flaw in that. And my recommendation is, that instead of trying to go out and get a huge buyers list, that you really try and just get a handful of investors, that you know, that you personally speak with, that then you can bring your deals to. Because the fact that of the matter is, is that even if you had a list of a thousand people, the likely hood is that you’re probably selling your deals to a very, very small handful of those investors. Maybe 15 or 20, and so the objective is really not, the objective should be not to build a huge list, but to have investors that you pick up the phone, that you call, you understand what they’re looking for, that they can give you input on your deals and say, you know what, that deal doesn’t work because of this, or that one is too high of a price. That then allows you to make adjustments with regards to your offers and your marketing. So that in the end, you can just simply pick up the phone, and call somebody and say, hey, I have this deal, do you want it, and they say yes, you put the deal in place and you move on to the next one. Because in the end, although, sometimes the perception is the seller is our client, the real client is the buyer. The buyer is really the person that we can deal with our business on because sellers come and go, lead sources come and go, but the buyers, really, if you have a core group of buyers that are able to buy your product, then you’re going to be able to sustain yourself, regardless of the lead source, and I think you’re going to have a better chance for success. Especially when you’re starting out brand new, it’s a lot easier to build a 10 or 15 buyers that are really solid versus 1000 buyers; that takes a long time. And so my recommendation is to really go for the few, go for the handful of guys and gals that you can talk to on a regular basis, get the intel you need and be able to sell them deals versus a thousands of them.